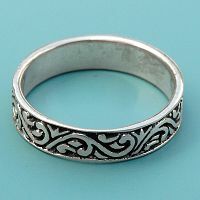 - Inspired by an age of Chivalry and Romance, this ring looks like it might have been given by a knight to his lady love. Its simple elegance and timeless appeal are sure to win your heart. 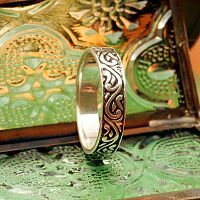 The Silver Medieval Ring makes a beautiful statement, whether you wear it alone or as a stack ring with other simple bands. This ring is made of sterling silver, and measures 3/16" across. It is available in sizes 7-10, whole sizes only. Choose Size... Size 7 Size 8 Size 9 Size 10 Please choose the Size. Do you have any other questions about our Silver Medieval Ring?